My daughter started kindergarten this past year. One thing she LOVES about school so far is coming about 15 minutes early to do “Running Club”. It’s a school initiative, but parents volunteer to give the kids popsicle sticks for every lap they run. At the end they turn in their sticks. When they turn in 100 sticks they get a necklace with a little plastic foot on it. Every 100 laps after that they add another foot until they get a “marathon” — a little plastic 26½. She loves getting the feet, but she REALLY loves just walking around the track talking and laughing with her girlfriends. So I decided I wasn’t going to do feet or whatnot, but wanted our daughter to have some incentive to do well. If we could do 5 laps every morning for 6 weeks, Monday through Friday, that’d be 150 laps. That’s pretty awesome. If she could do that with me, I’d take her to Disneyland for her birthday in October. Wow. That was motivation enough. I need the exercise (no I hate it. Really, really hate it). I did it to be with her. That’s about all I really need. so sweet! totally worth the sweat and burning chest. Awesome!!! 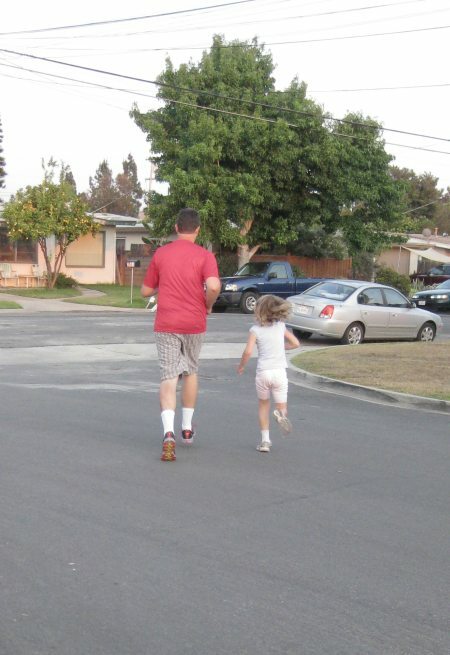 She will never forget that and will be totally grateful when she is in shape as an adult. Double +1 for Dad. No Triple +++.